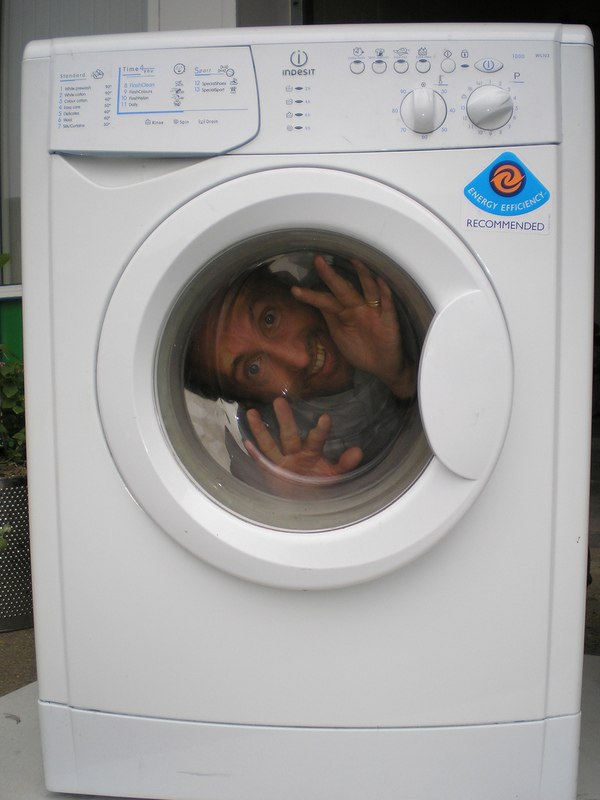 Following on from the news that 1500 outdoor launderettes have been rolled out across Europe, including a few in Ireland, a local Pomeroy firm have installed a man-sized washing machine in the village in an attempt to improve hygiene traditions amongst the male population. Although permission has yet to be officially granted by the European Health and Safety Commission, Devlin Washers are confident it’s only a minor paperwork issue. The three-pronged machine has a drum for men under 6 feet tall and one for those over that height. The smaller one costs £12 and the taller-sized option is £15 for a 30-minute cycle. The third drum is for drying, although Devlin Washers don’t expect much uptake in that as the district has traditionally good drying weather. This morning there appeared to be a queue of 25 men waiting for a full wash with the weekend on the horizon. Devlin Washers said to be patient and to have the correct money ready as no credit cards are allowed. The man-sized tumble dryer is currently out of order after a customer complained of heat exhaustion. An independent journalist from Omagh has finally released a body of work he undertook over a year ago which reveals the financial advantage the Dublin GAA team has over the rest of the country. McGorry’s book, called ‘The Well To Do Boys In Blue’, also explores how a handsome corner forward has spent over 500’000 Euros on liposuction, botox and colonic irrigation in order to maintain his film star looks. The book goes on sale in September in all good book stores. In all the euphoria of Sunday’s win, spare a thought for this woman who spotted Gavin Devlin’s trunks rip as Cavanagh equalised. A Dungannon woman is suing Facebook after her holiday was ruined because its app was not working right in Portugal on her phone. The White City mother, who spent 10 days in the Algarve, maintains she wasn’t able to upload photos for two whole days and more importantly was unable to comment on others’ posts for the whole vacation. Mullan admitted she was able to upload a picture on the last day of her husband playing crazy golf with a red head on him and a pair of long shorts but revealed it was ‘too little too late’. A source from within the European Championship winning Portugal management team has revealed that their manager, Fernando Santos, made a panicked call to an unnamed lough shore manager at half time during their final match against the host nation France. Santos, who holidayed in Ardboe regularly during the 80s and names eel as his favourite fish, was concerned that the infestation of moths in the Paris stadium was affecting his players and hoped that the experience of dealing with midges on the shores of Lough Neagh could be passed on to his squad. Portugal went on to win 1-0 in extra time, sparking wild celebrations in Porto, Lisbon and Dungannon. 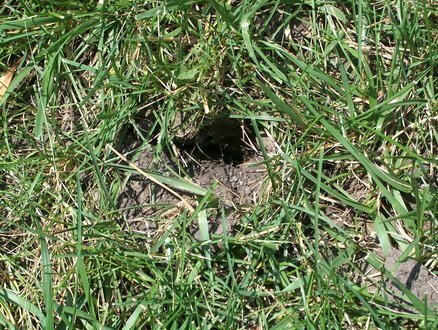 A summer scheme, set up to keep teachers busy over the holiday period, has been abandoned after one day due to their inability to dig a hole. ‘Real Work’, a teacher/summer work scheme initiated by the Omagh Management Group (OMG), saw seven teachers from the west Tyrone area sign up to four weeks of tasks including digging holes and lifting things. The seventh teacher, a Chemistry educator from the town, did manage to lift the spade but subsequently went out on the sick. Teaching unions are to issue a statement later, advising teachers to do nothing over the summer and to stay away from outdoor activities involving manual labour. Tuesday’s task of lifting a plank from one side of a barn to the other has been shelved until further notice. A group of over 30 Cavan supporters, inspired by the multiple good deeds by Irish supporters in France this summer, have landed a Tyrone fan in hot bother after they mended his limp and bad back on the road up to St Tiernach’s Park in Clones. Johnny McIlVinnery, a 51-year old retired mathematician from Strabane, had apparently been claiming DLA for a farming accident which led to a limp on his left leg as well as a bad back, allegedly caused by a furious donkey’s kick when he was 12. McIlvinney was also later seen celebrating Tyrone’s fifth goal by initiating a conga in the Gerry Arthurs Stand. DLA spokesman Gerry Armstrong has reminded Tyrone supporters at the Ulster Final that they’ll be watching.